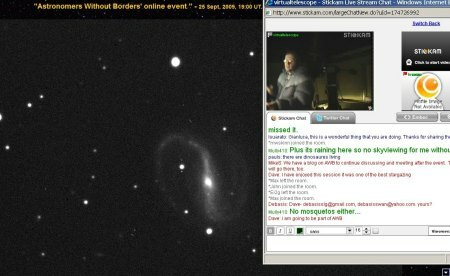 I have been a participant (AWB affiliate - Linzer Astronomical Society - LAG / AUSTRIA) of the first AWB- Remote Observing-Session. During this historic event I took some screenshots and drafted afterwards the following small review, about the event, about people behind it and some of my impressions. This page is part of a 99% German written page. 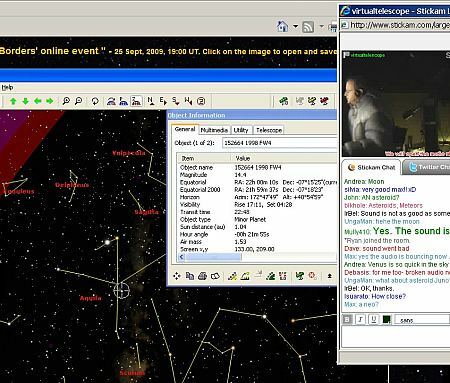 "AWB" and "The Virtual Telescope"
He has been an amateur astronomer for more than 35 years and loves sharing the sky with others. Mike joined the Los Angeles Astronomical Society in the early 1970s and served in many capacities including two terms as President and ten years on the Board of Directors. In 1976 he joined the staff of Griffith Observatory where he operated the Zeiss 12-inch refracting telescope for the public and described the many facets of astronomy to tens of thousands of visitors. In the early 1980s Mike was instrumental in founding the Mount Wilson Observatory Association (MWOA), a support organization dedicated to improving the experience of visitors to the renowned observatory. He served as the founding President of MWOA and has been on the Board of Trustees ever since. He is currently the MWOA Vice President. 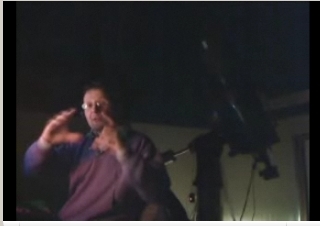 Mike's outreach efforts in astronomy broadened in 1999 when he traveled to Iran for a total solar eclipse. 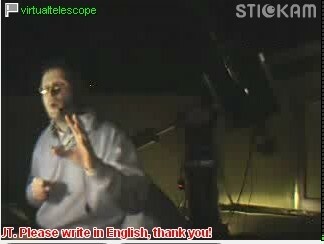 In Iran he found an enthusiastic astronomy community lacking the resources easily found in the West. He has since traveled to Iran several times, and in 2004 he led a group of Westerners to Iran to observe the rare Transit of Venus alongside hundreds of Iranian amateur astronomers. 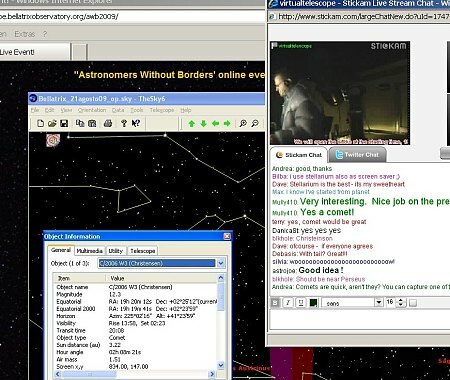 In 2006 Mike traveled to the Kurdistan region of northern Iraq, bringing observing equipment donated by American astronomers to their enthusiastic but isolated Kurdish counterparts. 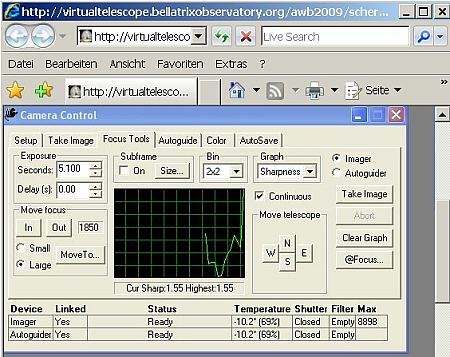 He has also assisted amateur astronomers and educators in many countries via the Internet. Seeing astronomy as a universal interest that transcends cultural differences, Mike founded Astronomers Without Borders in 2006. He now serves as President of this effort to unite astronomy and space enthusiasts around the world through those common interests. Mike is also a writer and photographer who has contributed to publications including Scientific American, Astronomy and Sky and Telescope. He regularly gives presentations, both in the US and abroad, on his experiences and interests, and on his outlook on international relations through astronomy. In 2005 Mike was presented with the Clifford W. Holmes Award, an honor given annually by RTMC for a "Major Contribution to Popularizing Astronomy." Minor Planet Simmons was named in his honor in 2003, in part for his "varied outreach activities in astronomy." is a Canadian astronomer based in Kingston, Ontario, where he completed his Ph.D. in astrophysics at Queen's University in 1992. He has worked in astronomy in Toulouse, France; at the Royal Greenwich Observatory, in England; and at the Anglo-Australian Observatory, in New South Wales. He is explaining the intentions of The International Year of Astronomy 2009: "IYA2009 is a year-long, global celebration of astronomy launched by UNESCO and the International Astronomical Union. 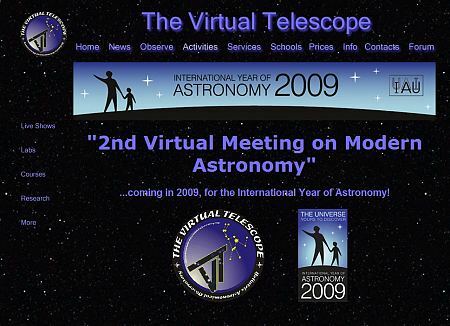 2009 was chosen because it is the 400th anniversary of the first use of an astronomical telescope by Galileo. During 2009, there will be an exciting and diverse range of astronomical activities in 135 countries around the world, including Canada. These activities will include stargazing, telescope viewing, astronomical talks, school visits, teacher training, webcasts, blogging, astro cafes, visits to planetaria and science centers, art exhibits, and more! The central theme of the IYA is "The Universe, Yours to Discover”, and a key aim is to stimulate worldwide interest in astronomy and science, especially in young people. 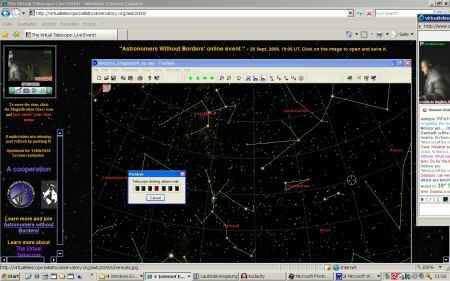 In Canada, IYA activities are being organized by professional astronomers through the Canadian Astronomical Society, and by amateur astronomers through the Royal Astronomical Society of Canada and the Federation des Astronomes Amateurs du Quebec." Lets hear some of his introducing words on his Website: "I'm 37 and I observe from Ceccano (FR, Italy), 90 km south of Rome. I graduaded with full marks in Physics (Astrophysical address) at the University of Rome "La Sapienza" and I earned a PhD in Astronomy at the University of Rome "Tor Vergata". My interest in astronomy started in 1980, when I was 8 years old: I read a book titled "La Conquista del Cielo" ("The Conquest of the Sky"), by G. Ruggieri. 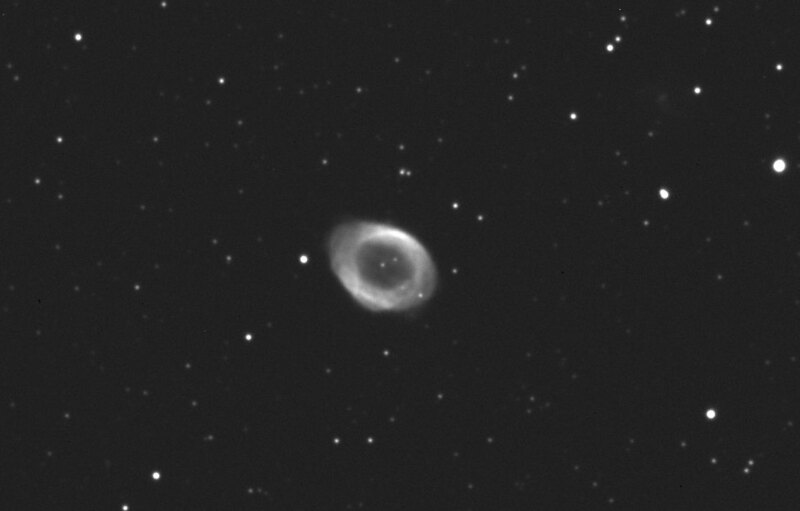 I was definitely captured by the images of nebulae and galaxies. 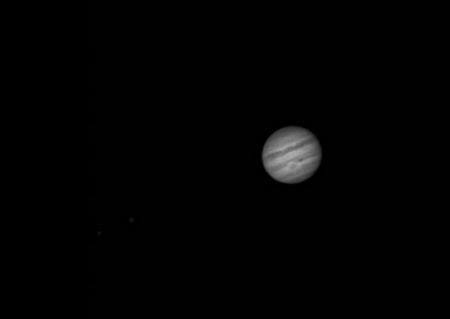 In 1983 I received my first telescope, a 6cm refractor. using it, I managed to observe the Moon, the Sun, a few double stars and the Great Nebula in Orion." Today, among others, he is "on board" at AWB and his enthusiasm to astronomy is unbroken. His activities, like the "1st. 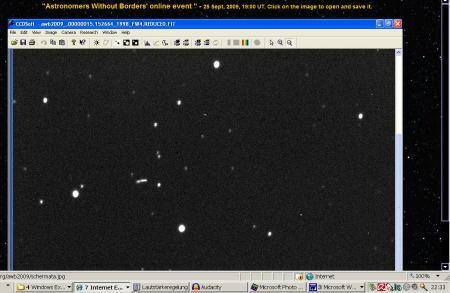 AWB Remote Oberving Event", are writing history to the Modern Astronomy! 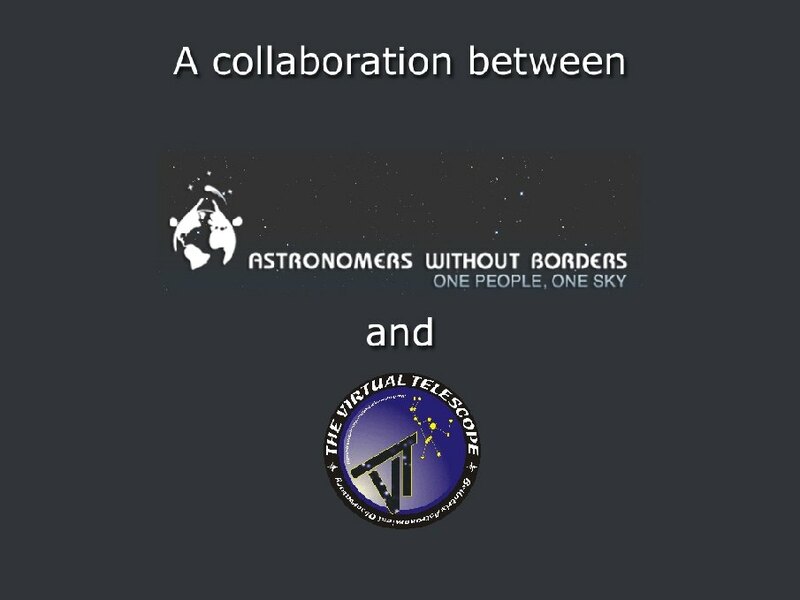 It was a great pleasure and honour for me to be a participant of the "1st AWB Remote Observing Event" and the "2nd Virtual Meeting on Modern Astronomy". 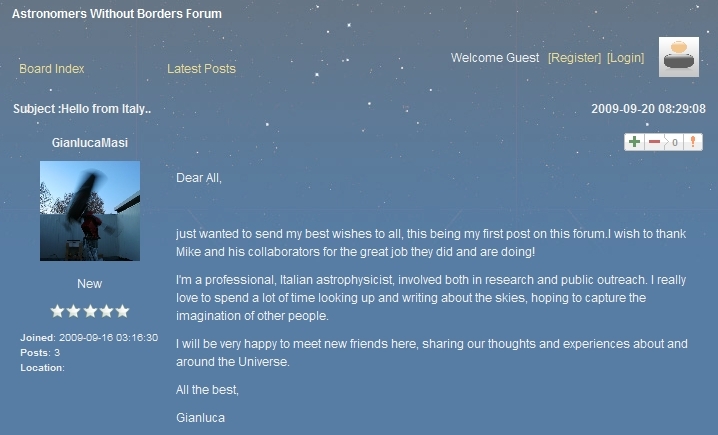 Dr. Gianluca Masi did a great job and it was exciting to be a member of the first big worldwide starparty ! 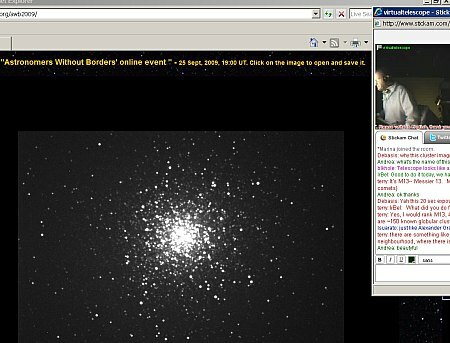 It was good chatting with Mike, Terry, Gianluca and many other participants around the world during AWB's first remote observing session. The observing session was much more than a test. For me and my feeling it was a initial ignition, "it's like a spark" as Mike expressed to me at the AWB-forum. 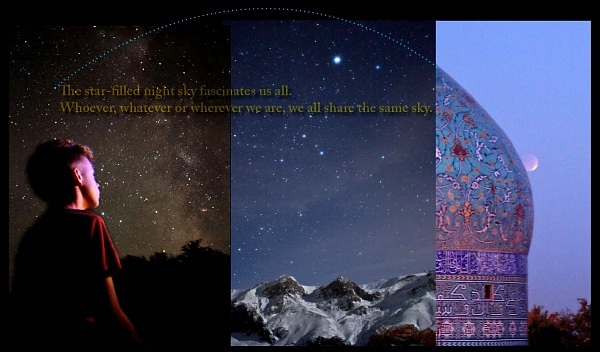 Simultaneously observing and sharing the beauty of our sky and talking to people around the world, across borders, of no importance which background the participants have (nation,race, religion, politic, profession....). The vision of creating relationship between people by the universal appeal of astronomy became true. It was a first step, I hope many steps will follow. 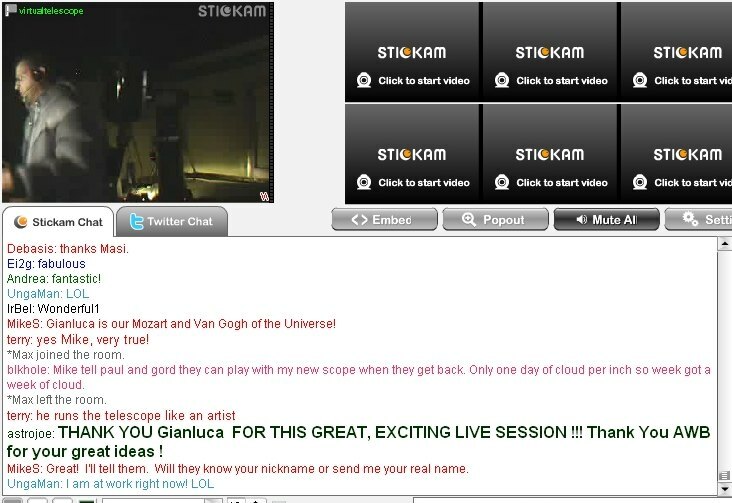 Below some more screenshots remembering the observing session, during this Gianluca did live his explanations via webcam for all of us, he handled the chat board, answered in realtime to our questions, selected objects for observing from starcharts and adjusted the telescope, he did the camera control and made a great job on quick image processing - WOW ! 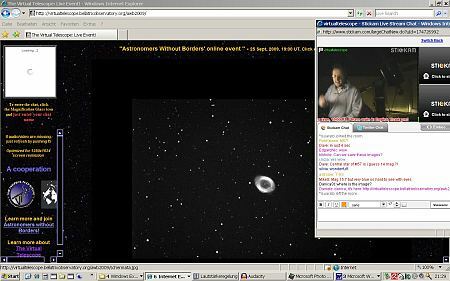 Gianluca is explaining via webcam the Ringnebula M57. One of several objects observed during the session. 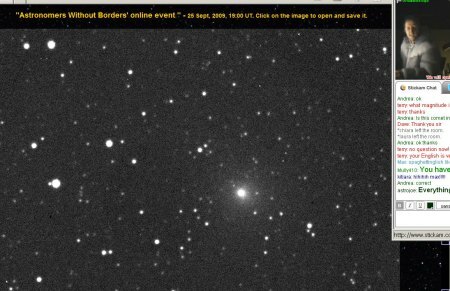 .... hunting the asteroid 152664 1998 FW4 ..... only a 1 minute exposure caused a distinctly startrail ! to lightpollution and the comments of Mike & Terry. 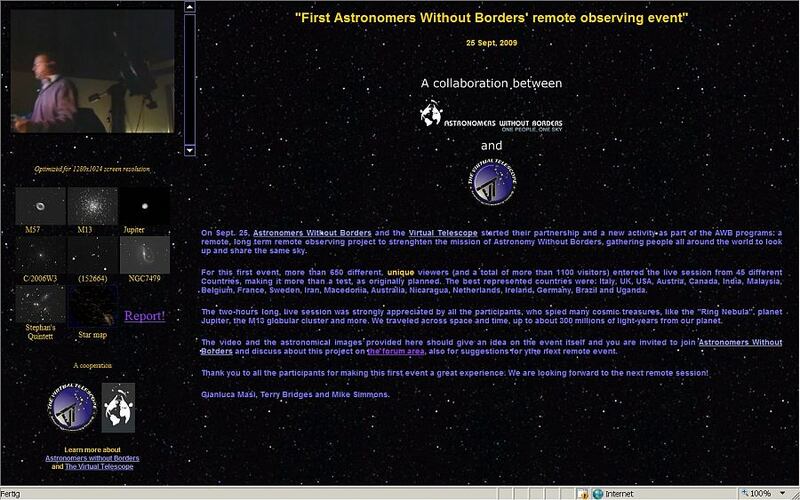 Undoubtful, a piece of history, concerning the feeling of togetherness around the globe of professional astronomers and amateurastronomers as well, has been written on this day. On this evening the slogan "ONE PEOPLE, ONE SKY" became true. We all could feel - at first hand - the connecting impact of astronomy.